Columbus was featured on KSL on April 21st, 2015. See the story below or on KSL’s website. SALT LAKE CITY — Cindy Bittle sits next to a conveyor belt, sorting the colored paper from the white paper. “We’re sorting papers. Taking all the colors off of it,” she said. She’s worked at the Columbus Community Center for the last 10 years. She and up to 80 others work for Columbus Secure Document Solutions. “I like it here because I have friends,” she said. But her other incentive is the money. “I get a paycheck, and I can get what I want,” she said. Stephanie Mackay, director of development, said everybody at Columbus gets a paycheck. “I think probably payday is the most fun day around here,” she said. Bittle often uses her paycheck to buy Star Wars related items. They are her favorite movies. “I get me new coloring book, a new colored pencils, that I can make pictures of,” Bittle said. But the employees at Columbus have different challenges than other employees. “Columbus is a full-service provider, and we provide services for individuals with developmental and physical disabilities,” Mackay said. The center services about 450 people a year through residential services, training and employment or a respite care program. “Individuals with disabilities have a 65 to a 90 percent unemployment rate, depending on the level of disability,” Mackay said. With some training and transportation assistance, many work for local businesses. Individuals with disabilities have a 65 to a 90 percent unemployment rate, depending on the level of disability. “They’re either working here at Columbus in one of our six business lines that we operate, or they’re working for employers out in the community,” she said. 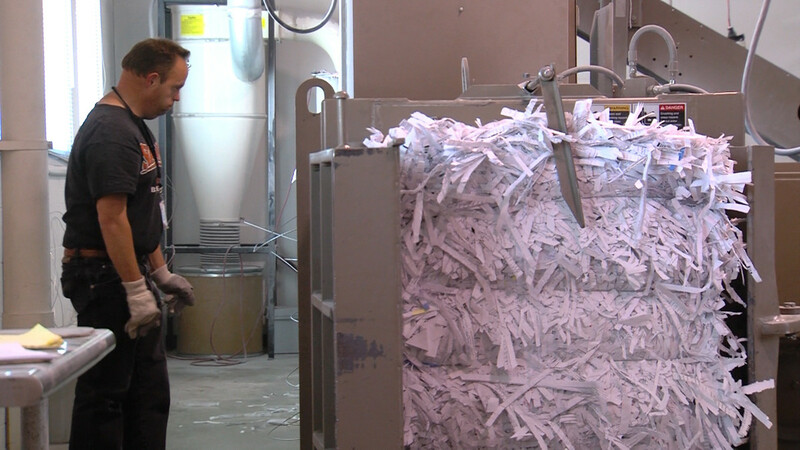 The shredding business started about 12 years ago. Jeff Watts has worked at Columbus since 2003. He said he likes working there a lot. And like Bittle, he also gets paid. During her time at Columbus, Mackay has realized the identity people build around the work they do. “One of the things I’ve come to appreciate working at Columbus is the dignity of work,” Mackay said. Bittle uses some of her earnings on her family. Mackay said it means everything to them as it does to anyone who gets a paycheck. Watts is saving up his money for a special trip. He said he’s going to Disneyland. “Yeah, it’s my favorite happy place,” he said. Columbus also offers a gathering place for retired employees. “We started with a handful of people in a retirement program and since then it’s really morphed into a retirement day activity program,” Mackay said. It also serves as a respite care program for those who need it. Mackay said it’s impossible to have a bad day at work when she goes to Columbus and sees the happy, hardworking people there.